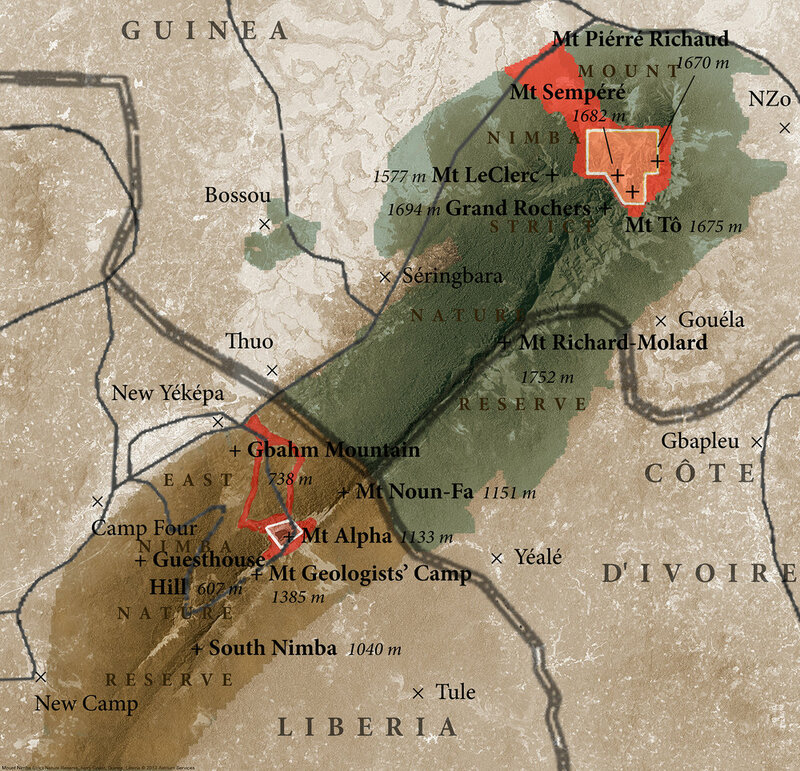 Mount Nimba may be unknown to all but those who live near it and a small clutch of researchers, but it is an unparalleled biodiversity hotspot in West Africa, located at the intersection of Guinea, Liberia, and Côte d’Ivoire. The 40-km-long Nimba Range (also called Mount Nimba) rises to 1,752 meters at Mont Richard-Molard. Here dwells the only species of live-bearing toad, unique otter shrews and butterflies, and an endemic subspecies of chimpanzee. All of them are very rare and endangered. Correction: there are others who know about Mount Nimba. Mining companies. The Nimba Range contains massive quantities of extremely pure iron ore. In 1967, only about twenty years after the first nature preserve was established at Mount Nimba, mining companies began operations there. In 1982, Mount Nimba earned its World Heritage status, but it has also been at the top of another list ever since: the World Heritage Sites in Danger. This agreement granted Euronimba Ltd., a consortium of mining companies, access to concessions estimated to contain 9 billion tons of iron ore.
“The shareholders of Euronimba [are] Areva, BHP Billiton and Newmont,” explained Jabara, “with SMFG being the operating company in Guinea.” Sumitomo Mitsui Financial Group, Inc., or SMFG, is a Japanese financial holdings company, and BHP Billiton is a British-Australian mining conglomerate. When I spoke to Jabara, the price of iron was strong at $130 per tonne. A year later, however, the price had precipitated to less than $70 per tonne as investors expected a fresh surge of supply. Amid this abrupt freefall in the market, the Luxembourger giant ArcelorMittal bought out the 43.5 percent of Euronimba owned by BHP Billiton as well as the 13 percent owned by Areva. This gives ArcelorMittal the majority stake in Euronimba, with the remainder belonging to Newmont. “Mining will certainly have an impact on the environment of the Nimba Mountains,” says Dr. Kathelijne Koops. At the University of Zürich in Switzerland, she’s an anthropologist who has studied the chimpanzees of the Nimba Mountains since 2003. Koops says that, despite her tenure in the Nimba Mountains, she and her colleagues have not been privy to the environmental impact assessment. “We also remain unaware as to where Euronimba is at precisely,” Koops tells me. The 5,000-hectare section of the Nimba Range within Côte d’Ivoire was established as a nature reserve in 1943, and it was included in the UNESCO World Heritage Site of Mount Nimba Strict Nature Reserve in 1981 alongside the Guinean portion. An estimated one billion tons of high grade iron ore lie within its mountains. In March of 2013, Prime Minister of Côte d’Ivoire Daniel Kablan Duncan reached an agreement with M. C. Thomas, project manager for Tata Steel Ltd., a global mining corporation based in India. As if to drive the point home, Member of Parliament Evariste Méambly motioned in June of 2013 to permit the exploitation of iron resources within the protected Nimba Range. Before the National Assembly, he asked, “What wins the Ivory Coast in the rankings in the Mount Nimba World Heritage?” Méambly suggested that the impoverished people of the nation should benefit from sitting atop a cache of top quality iron ore.
After the war in Liberia ended in 2003, companies moved to reopen the mines there. One such company is ArcelorMittal Liberia Ltd. (AML). To protect the Liberian section of the Nimba Range, it was declared as the 13,569-ha East Nimba Nature Reserve (ENNR) in October that year. In August of 2004, the chairman of the transitional government, Charles Gyude Bryant, made a handsome profit for the US$10 million sale of iron ore that had been held up in the port city of Buchanan during the war. A year later, AML finally acquired the rights to the old mines when Bryant signed the US$1 billion deal. AML’s environmental impact assessment was completed in March 2013. It describes that the high altitude montane forests have been eradicated due to past mining operations. Dr. Nicolas Granier, a primatologist at the University of Liège in Belgium, is highly concerned about those impacts. “Definitely, iron ore exploitation would have catastrophic consequences on the exceptional and unique biodiversity of Nimba.” He has worked with the chimpanzees and other large mammals of Nimba since 2003.